I’m ready for the cold days, or at least, my hands are. In my heart I hope for many warm and beautiful, clear autumn days to come, and I can very well do with a minimum of cold days. To be honest, whispering, I could even skip the snow, end of whisper. 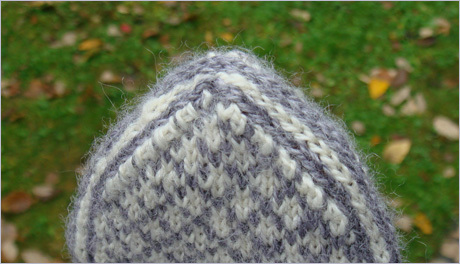 The pattern of the Anemoi mittens is a delight to knit. I have said it before, and I have nothing against repeating myself: Eunny is a wizard when it comes to pattern making. And I like very much the asymmetry of the colour pattern. 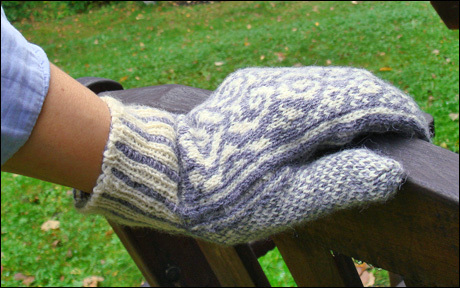 The Anemoi mittens were a fast knit, and a nice knit. Alterations: I like mittens that have quite narrow ends, and thus I didn’t follow Eunny’s decreases, but decreased on every row, and when I had 14 stitches left, that are the border stitches, I transferred the stitches to the inside and made a three-needle-bind-off there over 2x7 stitches. I find it very hard to graft in two colours, but if any of you have a good description on how to do that, please let me know. Grafting is more beautiful than the three-needle-bind-off, so I’m all for learning something new. Could also be called -The new favourite technique of the year-. Those of you, who have followed my entries from the beginning of this year, or longer, remember the bear coat I knitted earlier for the Nelli bear. The coat was kimono-ish, with the Anemoi pattern repeated five times, two of the sequences mirrored, and knitted out of blue and white Regia silk on 2 mm needles. 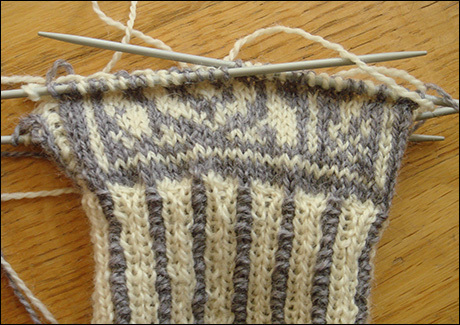 I have since several times considered knitting the real things, or the Anemoi mittens, as Eunny designed them. And now it was the time. I had already cast on for an other pair of mittens, got bored, ripped it out, and was wondering about what to do now. 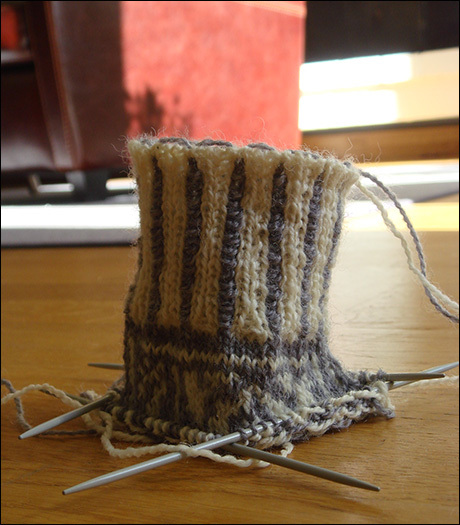 And decided to start the Anemoi mittens (brief explanation on the anemois can be found in the bear coat entry). Look, look! The sun is shining! The mittens are to be started with a tubular cast on. Eunny does not explain more than that in the pattern (at least the download I have, which is from the very first days this pattern was up, so perhaps there has been an alteration, I don't know), only that you should continue with two rows of K1, sl1 after the tubular cast on. I tried the tubular cast on I used for Blustery, but it got too tight, even after switching to 2,5 mm needles. Not too pleased with the result I put the mittens aside, and started a brain dead blog surfing, going through fav blogs looking for new interesting blog links. In Francesca's blog I found a link to her "Tubular cast on without waste yarn, alias The Italian tubular cast on", and when I read through the instructions, a couple of small bells started ringing somewhere back in my head. I know I have read somewhere, perhaps on Eunny's blog, perhaps somewhere else, about this cast on. I immediately ripped out everything I had knitted, and started to cast on, looking at Francesca's excellent video instructions. And the cast on is perfect, just what these mittens ask for. It's beautiful, it's elastic, and you don't waste any yarn at all with it. And it is easy and pretty fast to set up. This is definitely the best new technique I have learned this year, and one I will be using again, for sure. I did cast on on 2, 5 mm needles, but I think I could even have gone down to the 2 mm needles the pattern suggests. Big thank you to Francesca for the excellent tutorial! And so far, that the tubular cast on is not explained better in the pattern is the only thing I have to say against the pattern so far. It is a dream of cleverness and clearly explained details, just what one can expect, in fact what one have learned to expect from Eunny's patterns. The details are worked out with so much thought that one can only admire Eunny's abilities as designer. The pattern on the inside of the hand is totally mindless, and the pattern on the other side easy short and easy in comparison to repeating it five times, and I have the feeling that the knitting is just flying. Lovely! But enough about the Anemoi mittens. When I'm finished with this entry I'll not pick up the mitten and continue knitting grey and white swirls, no, I'll take out my charts and finish writing up the Rosebud mitten pattern. 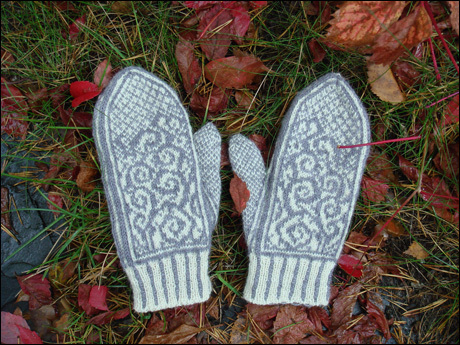 Coming up next, the rosebud mittens pattern!